Height: 8-10 feet Full sun for best color, will do well in partial shade also Hardy in zones 5-10 Easy to grow Immediate shipping in 4" pot. Shipped dormant in the winter. 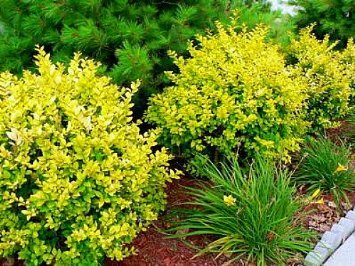 Golden Vicary Privet makes an excellent hedge with good growth rate, and large, dense foliage. Foliage is semi evergreen to deciduous, mainly depending upon climate & hardiness zone. In zones 8 & up, has shown itself to be semi evergreen - retaining many of its leaves through the winter season. But in colder climates & zones, will be completely deciduous. Newer growth is a vibrant golden yellow, gradually maturing to a bright green. Produces small inconspicuous white flowers which are well known to attract bees & butterflies. This variety responds very well to trimming, and can be kept at wide range of heights & widths, which makes it a very versatile selection for a variety of location & uses. Very hardy - tolerant of a wide range of conditions. Picture is for example only. Currently shipping a plant in a 4 inch pot.